2. Go to the product page on the website for the pump you are interested in and check the size guide. 3. 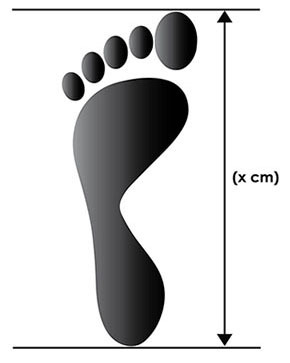 Look for the closest measurement on the size chart to your foot measurement. It probably won’t match your size exactly but look for the closest ones. e.g. Your foot tracing is 217mm and you want to purchase this style. Unfortunately, the truth is the shape of a dancer’s foot is as unique as a fingerprint. Without a visit to our Wembley store (where we can do a personal fitting! ), we are unable to take account of all of these factors so while our sizing guide really does help 90% dancers get the correct size, the sizing recommendations won’t be right for everyone.